What about Charleston's turbulent past? Holy City Tours, a new walking tour group in Charleston, is ready to bring the city's intriguing and turbulent history alive. 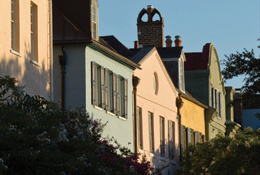 The Walk Through History Tour is a comprehensive overview that will introduce Charleston as the early colonists saw it, complete with stately mansions and concentrating on the city's captivating and sometimes controversial past. It is a wonderful way to experience the Old South.